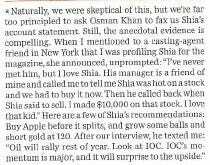 After acting in the movie Wall Street II, Apparently Shia LeBouf thinks he’s qualified to give stock picks, and he shares them with the readers of GQ. They are below, printed in a small footnote on page 149. And this isn’t the first time a men’s magazine has tried to give its readers investing advice. Esquire told it’s readers to buy gold last month. It’s almost certainly the worst advice to take ever, not because Shia or the Esquire author might be wrong, but because it’s printed in a men’s fashion magazine.